Took in Marvel’s Guardians of the Galaxy last weekend (along with so many others). What a fun show! Marvel Studios continues to hit that action-adventure-humor sweet spot, and we would guess that while the majority of the viewing public never heard of Drax or Groot prior to this film, they’re fans now. Because no one’s demanded it, we’re going to try a little switch on the review format here. Instead of the longer summary form, we’ll just go with the likes and dislikes, hits and misses, cheers and jeers. Cosmic Marvel – The intergalactic, sci-fi area of the Marvel Universe has a lot to offer. Although Stan and Jack originally created some of the aliens and creatures just to give the Fantastic Four or Avengers someone else to fight, the vastness beyond Earth has provided creators with so many opportunities to tell new stories, mix favorite elements of space opera and sci-fi, and envision new worlds. Guardians, with its mishmash of alien cultures and locales, uses this to great effect to create that fun Star Wars vibe. We’ve seen hints of Cosmic Marvel in the Avengers-themed movies (especially Thor), but this one really nails it, with references to old school creations like the Kree and Skrull war, the Celestials, and more. Set Design/Art Direction – Closely tied to the above, big kudos to the visual arts team. It’s incredible what they can create on screen these days. Whether it’s Starlord’s ship (orange and blue, baby! ), Ronan’s Dreadnought cruiser, the prison, Knowhere (awesome! ), or Xandar, the overall result is fantastic. Not just because of the vivid colors and attention to detail, but also how these environments interact with the characters without suspending the disbelief overly much. Chris Pratt – Starlord, man! As a big Parks and Recreation fans, we already knew about the comic timing, which Pratt applies repeatedly and expertly. He’s a great choice as that Earth-transplant every-dude. Of course Peter Quill/Starlord has so much potential as an archetypal character. With a boyhood spend on earth in the 80s, he has those frames of reference, the music, the lingo. He knows about Captain Kirk and Han Solo and is fully attempting to pull that off. Pratt’s convincing in the action scenes, and has the range for the more serious moments as well (although you could feel the clowning right around the corner). His scenes with Gamora (Zoe Saldana) were fun and Saldana also deserves a lot of credit for her performance. Writers/Script – The story’s pretty straightforward: Quest for treasure turns into a mission to stop the evil overlord. The characters are your typical band of misfits. 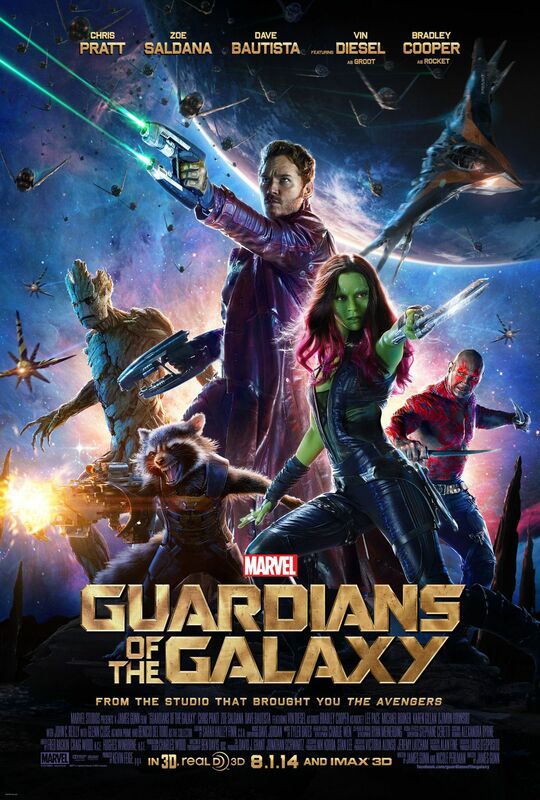 But give a lot of credit to the writing team – James Gunn, Nicole Perlman, Dan Abnett, and Andy Lanning. There’s real economy in their scenes; they set up character traits quickly, and the comedic moments are plentiful without feeling forced. Drax taking everything literally, Rocket’s antics and tough-guy veneer, Groot… We also appreciate some of those smaller moments and how they worked in a few Marvel easter eggs like usual. They didn’t overdo the Starlord/Quill character arc, they didn’t force some grand epiphany upon the character. And whoever came up with the idea for that final showdown with Ronan – well that writer deserves an award. I thought the post-credit mini-scene (now a tradition) was a little weak and somewhat frightening in an 80’s flashback kind of way. This isn’t really a dislike, but rather an observation: the movie had just a little too much violence and a one too many crude jokes for me to bring the kids along. They’re just going to have to wait, which is too bad, because they want to see Guardians very badly. …written by Christopher Marcus and Stephen McFeely, based on an Ed Brubaker story; directed by Anthony Russo and Joe Russo; starring Chris Evans, Scarlet Johansson, Samuel L. Jackson, Anthony Mackie, Sebastian Stan, and Robert Redford. These Marvel movies just keep hitting the target. Thor – The Dark World was excellent, X-Men – Days of Futures Past looks fantastic based on the trailers, and we’re optimistic for the next Spider-man movie this summer as well. The only one we’ve panned of late was Iron Man 3 (because, gah.) So with the the great early buzz, we were anticipating Captain America: The Winter Soldier, and we weren’t disappointed. This is another great super hero movie. It’s a different kind of super hero movie, though. Based on comics by Ed Brubaker, the story involves serpentine conspiracies and secrets and healthy mistrust of those in power. Pretty much par for the course with Hollywood’s take on the espionage game. This movie features Cap and Black Widow as Shield’s two prime field agents, chasing down bad guys and running ops for Nick Fury. When one of these ops goes sideways, Cap gets suspicious of Fury’s motives and goals. He becomes even more concerned when Fury shows him the strategic plan to launch three additional heli-carriers capable of linking up with surveillance satellites and securing Shield’s military dominance in the world. But Fury has concerns as well. He’s noticed something anomalous, a security breach, and confides in the Chief of Allied Defense, Alexander Pierce (Redford). About this time, the Winter Soldier shows up and takes a crack at Fury. Black Widow tells Cap about the Winter Soldier: a legendary KGB assassin rumored to have conducted the most dangerous and sensitive assignments for over 50 years. 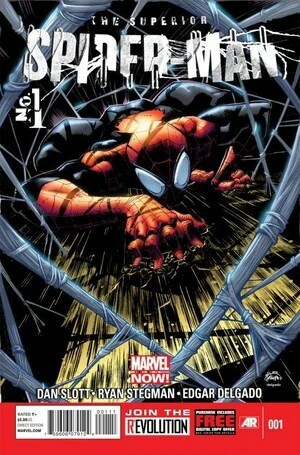 In Brief: Superior Spider-man, written by Dan Slott and illustrated by Ryan Stegman, takes Spidey in new directions with a bold narrative twist. Volume 1, ‘My Own Worst Enemy’, and Volume 2, ‘A Troubled Mind’, collect the first 10 issues of this ongoing series. Books like this one continue to show that Marvel is more than a marketing arm – they still produce great comics stories. Pros: Slott picks up from the historic events Amazing Spider-Man #700 and continue with strong storytelling involving major changes to Spider-man and his world. It’s a much different kind of story, but that makes it no less effective. Stegman’s panel work and ability with the action and staging are first rate. Cons: Well, this is a major shift. It certainly has the potential to put long-time Spider-man fans, especially if you haven’t been keeping up with the comic books. You just have to give it a chance. In Brief: These first two volumes of Thor, God of Thunder, written by Jason Aaron with principal art by Esad Ribic, give us three versions of Marvel’s Thor from three separate eras. Thor must track down and face the God Butcher, a foe from his distant past, present, and future. It’s cosmic comics adventure that takes full advantage of the current Avengers cross-over appeal. Pros: The story is first rate – epoch-spanning, with bits of Asgardian and Marvel Universe lore, while clearly being centered on Thor. Ribic’s art has a Dark Horse/Conan flavor that effectively captures galactic grandeur and Middle Age Norse grit. Cons: Well, the price. The two hardbound volumes retail at $25 apiece. But that’s a problem the comics industry continues to face. Also, movie fans hoping to see Loki won’t find him here. We did not expect our favorite super-hero/action movie of 2013 to be Thor: The Dark World, and yet there it is. Iron Man 3 was not good, Man of Steel was problematic and should have been better… We have not yet seen The Wolverine, but based on the reviews and chatter, we doubt it will eclipse the son of Odin. Thor: TDW had the right blend of humor, action, and Asgardian mayhem, as well as an imminently watchable Loki and Thor dynamic and some Avengers 2 easter eggs. If you’re into the superheroes, you should check it out. And, of course, it hath spawned another excellent ‘How it Should Have Ended’, this time featuring the Villain Pub. One of the few episodic shows we continue to watch returns for its fourth season this Sunday: The Walking Dead on AMC. Not since we watched The Wire have we been so enamored with a show that can just be so damned depressing. If you’re behind on episodes or looking to catch up with the plot again, AMC is currently running through all the prior seasons leading up to this Sunday. I still remember picking up the very first trade of Robert Kirkman’s series back in the day, when the buzz about the comic book was starting to increase, and thinking the central premise was a pretty blatant rip-off of 28 Days Later (guy wakes up form coma and zombie apocalypse has ensued). But the way he set up the characters and paid them such careful attention, the focus on the human element in the midst of such a horrible situation – these really stood out. I still want to back and check out his book, Invincible, a character-driven take on the familiar teen and family superhero story. We took in Iron Man 3 this weekend for family movie night. Mostly, it was what you’d expect: a fun comics themed actioner aimed squarely at the mass markets. The kids and wife enjoyed it. I mostly enjoyed it. And we understand and fully support Disney/Marvel’s approach here. We’re glad to have shared-world Avengers movies with a sense of continuity, big budgets, and A-list talent. However…. However, and not to go all Comic Book Guy here, because Iron Man was never a personal favorite or anything, but I do have to go CBG here. Because just like Man of Steel, the writers/director sort of missed some key elements with Iron Man 3 and kind of blew it to the point of ludicrousity.